This painting depicts a Water Dreaming. 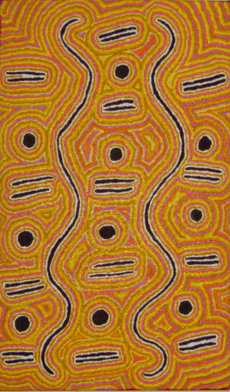 The rain (ngapa) story belongs to Nampitjinpa and Nangala women and Jampijinpa and Jangala men. The ngapa jukurrpa travelled from east to Mikanji west of Yuendemu. The curvy lines represents the ngawarra (flood waters) running through the landscape. The small bar shapes signify mangkurdu (clouds). The samll circles are julju (water soakages).